1) An aid in the development of search criteria. What are the challenges before the district? What leadership skills are needed? 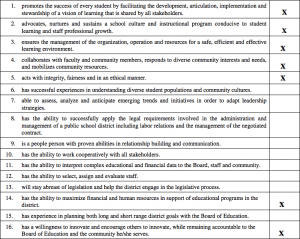 What does the board really want in a new superintendent? 2) As a resource for the board’s preparation for interviews with finalists. What are the issues? What are the key questions? How might they be addressed in conversation with finalists? 3) As an orientation document for the new superintendent. The following are some of the things that individuals had to say about the district and the task of the superintendent. As such, they will provide some helpful perspectives to the person assuming the job. Advocates, nurtures and sustains a school culture and instructional program conducive to student learning and staff professional goals. Has a willingness to innovate and encourage others to innovate, while remaining accountable to the Board of Education and the community he/she serves. Acts with integrity, fairness and in an ethical manner. Ensures the management of the organization, operation and resources for a safe, efficient and effective learning environment. Has proven abilities in human relations and communications. Collaborates with the faculty and community members, responds to diverse community interests and needs, and mobilizes community resources. Promotes the success of every student by facilitating the development, articulation, implementation and stewardship of a vision of learning that is shared by all stakeholders. Has the ability to maximize financial and human resources in support of educational programs in the district. The Board of Education is very interested in your input as it seeks to hire a new Superintendent for Edwardsville CUSD 7 survey is provided by the Illinois Association of School Boards, who is assisting us. The survey results will be shared with the Board of Education, but all survey responses and comments will remain anonymous. Thank you! Instructions: READ the following 16 items. Choose the SIX items that you believe identify the traits or skills the next superintendent must have that demonstrate a good match for the district. Prop-E Success; fiscal distress for 10 years. Courage to acknowledge our shortcomings, engage stakeholders in the improvement process, and act. Leadership that supports, develops, and retains high quality staff; builds internal capacity.